The film, which released on Friday, has been receiving mixed reviews from critics and audience. Despite mixed reviews, the film is dominating Box Office like a boss. Vakkantham Vamsi’s debut directorial Naa Peru Surya starring Allu Arjun has finally entered its first weekend. The film, which released on Friday, has been receiving mixed reviews from critics and audience. Despite mixed reviews, the film is dominating Box Office like a boss. The film has raked in Rs 85.32 Cr worldwide in the three days since its release on May 4. This includes numbers in its Telugu, Tamil and Malayalam versions. Despite a slow start in the international markets, Allu Arjun starrer has successfully managed to touch half a million mark in the US on its second day. It remains to be seen how the film performs in the coming days. The makers of the film had high expectations but despite mixed reviews, the film has managed to put decent numbers on board in three days. Rs 85 crore is of course not a bad figure. 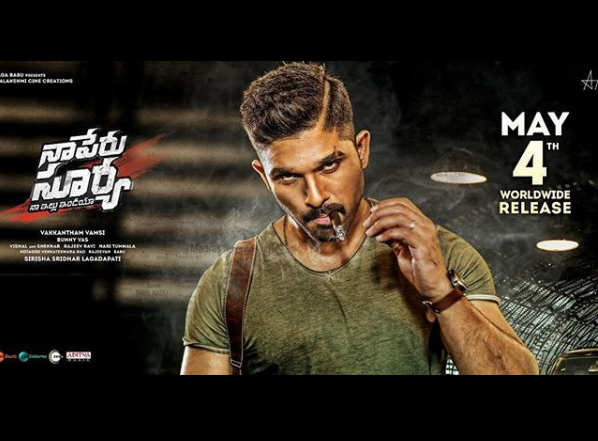 NPS sees Allu Arjun in a very strong role. The film also has Arjun Sarja, Sarath Kumar and Thakur Anup Singh in pivotal roles. The music of this film is composed by Bollywood duo Vishal-Sekhar. The film has a lot that has impressed the audience in the cinema halls. From Bunny’s aggressive military officer role to his romantic track with Anu Emmanuel, Naa Peru Surya managed to stay in the limelight.